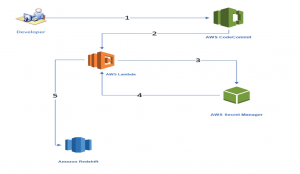 Need to reduce the overhead of user access management on AWS Redshift clusters. User commits DDL execution files to an AWS Codecommit repository. The update to the Codecommit repository sends an event to AWS Lambda. The Lambda function pulls down the source code and requests the connection information for the AWS Redshift Cluster from AWS Secret Manager. The logic we employed was simple, by reading the commit log we could tell which files were added/removed but we could not figure out what sequence the files had to be run in. To solve this issue, we enforced a strict commit message syntax to indicate the sequence in which to run the files. We now have the run order of the files and attempt to run them using psycopg2. Previous Post Near real-time Data Marts using AWS Glue!